BBC World Service and Deutsche Welle (DW) are launching a new Digital Radio Mondiale (DRM) digital radio channel for South Asia. The channel will carry a four-hour daily broadcast that includes the best international programmes in English and Hindi from BBC World Service and Deutsche Welle. 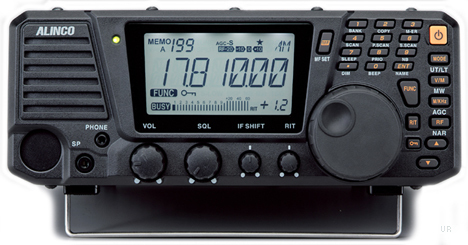 It will also bring to the audience all the advantages of DRM digital radio including near-FM quality audio, text messages, Journaline and an Electronic Programme Guide (EPG). This joint initiative between BBC World Service and Deutsche Welle has been launched using two transmitters in the region and will cover much of South Asia. The signal covers the majority of the Indian sub-continent and may reach as far as Pakistan, Bangladesh, Nepal and other neighbouring countries. The new transmission starts on 31 October 2010 and will be broadcast from 1400–1800 GMT each day. Listeners will find the new programme stream on 13590 and 5845 kHz (SW) and additionally on 1548 kHz (MW) between 1700–1800 GMT. This entry was posted in Broadcasters, DRM, News and tagged BBC, BBC World Service, Deutsche Welle, Digital Radio Mondial, DRM, DW on October 31, 2010 by Thomas. On October 30, 2010 at 0100UTC on 9955khz, PCJ Radio will present a special broadcast of HG Wells’ War Of The Worlds as it was originally broadcast on CBS Radio. PCJ is also giving away 3 copies of this program. If you would like a chance to win one send them an email at: pcjmedia@gmail.com. This entry was posted in Current Events, News and tagged 9955 kHz, PCJ Media, Shortwave Programs, Shortwave Radio Specials, War of the Worlds, WRMI on October 26, 2010 by Thomas. C. Crane’s well known CCRadio-SW is currently on sale for $114.95! I assume this sale will only last through to the end of October, 2010. This is a very good deal for one of my favorite, big audio portables. Curious? Read my review on SWLing.com. This entry was posted in News, Reviews and tagged C. Crane, CCRadio, Radio Deals, Shortwave Radios on October 20, 2010 by Thomas. For as long as I can remember I’ve been passionate about radio. From my earliest childhood memories in the 1980s during those final fading days of the Cold War — of my dad tuning in WWV in Fort Collins, Colo., on his dad’s vintage RCA 6K3; of falling asleep listening to my then-old-fashioned AM transistor radio; and of drinking in all those mysterious DX stations I heard over shortwave and medium-wave … I was the sort of kid (a throwback to a former generation, one might say) who couldn’t get enough of radio. In those days when cable TV and video games and the first PCs upstaged and supplanted radio in nearly every American household, even in the blue collar town in which I grew up, it was nonetheless radio that captured my imagination, and taught me early on that everyone has a story. Radio taught me, too, that each voice is different in his or her consideration of what’s meaningful or newsworthy. I learned to understand or at least appreciate the diverse perspectives I heard in my vicarious radio journeys, and from these sprang my own opinions, hopes, beliefs. 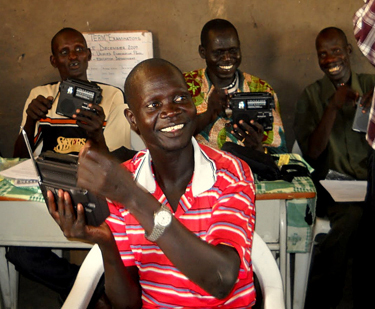 Radio became my teacher—a teacher who gave me, in my formative years, a global perspective. …Today, I am the founder and director of Ears to Our World, a grassroots charitable organization with a simple objective: distributing self-powered world-band radios to schools and communities in the third world, so that kids, not to mention those who teach them, can learn about their world, too. I want others –– children and young people, especially –– who lack reliable access to information, to have the world of radio within their reach. This entry was posted in Articles, News, SWLers and tagged Ears To Our World, ETOW, Radio World Online, Shortwave Radio, Thomas Witherspoon, Why Shortwave Radio on October 15, 2010 by Thomas.